Bio-Buddy | Dog Waste Bags-Pickup Solutions and Dog Owner Targeted Advertising Hanging Dog Waste Bags-No Waste Dog Waste Bags! Less waste than other hanging bags! No Waste remains in the dispenser after use! No cardboard or plastic header remains after use so less changeover time and trouble for maintenance crews! 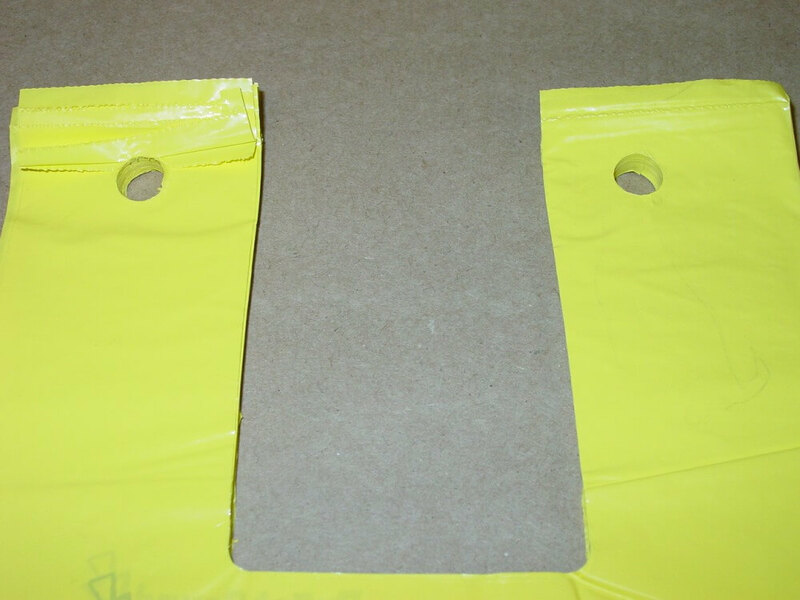 Hanging dog waste bags have been limited to header, carded, mitt style bags that require either a cardboard header or a wasted block of plastic at the top of the bundle in order for the bundle to hang in the dispenser. We constantly heard from dog park maintenance folks that it was troublesome and a waste of both material and time. Hang the bundle as you normally would. Pull a bag and it comes out clean. No residue left in the dispenser! Brightly colored, resulting in easy spotting of used bags that might end up under a bush. Also we have found that brightly colored bags end up in the proper garbage can more often than dark colored ones. 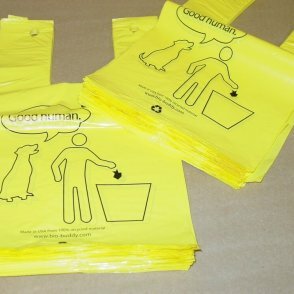 Printed with humorous, positive message to encourage responsible dog waste pickup. 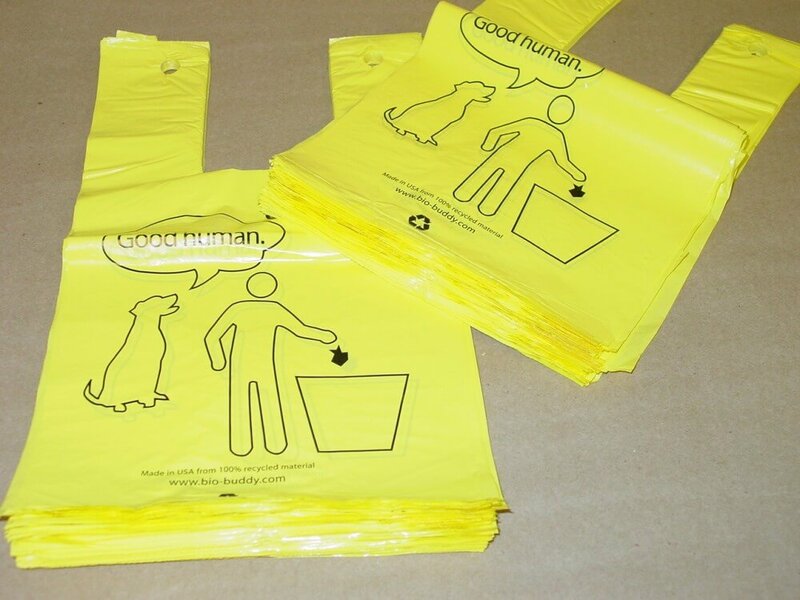 Each hanging dog waste bag has handles allowing the user to easily tie the used bag closed. Once tied closed, the handles serve as an easy way for user to carry the bag to the nearest garbage can, resulting in less used bags in the bushes. Pricing above are FOB our factory. For larger quantities please contact us directly. Contact us at bio-buddy@wimancorp.com or call us at 800-694-0017. We are happy to set up accounts and provide terms to municipalities and dog park groups!